I call it my Freecycle bathroom since almost all of the items used in our remodel is from freecycle. Took a few months to acquire everything, the power of manifesting should not go unnoticed though. 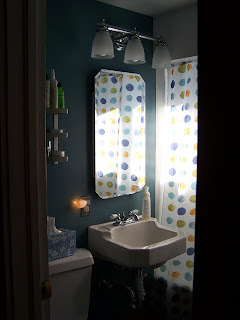 The light fixture was a house warming gift from my FIL and the shower curtain I picked up in the AS-IS section of Ikea. We still need to redo the floors but I'm waiting till I see something worthwhile on freecycle. And yes even the paint I got on freecycle. The wire shelf on the wall is actually a spice rack from Ikea that I picked up on freecycle, just to make things confusing. :) The overall cost of the remodel was less than 200 bucks and that includes the new shower walls that my FIL and hubby installed. The bathroom feels much more spacious and you actually want to spend time in there now. Wow. Wow. Wow. I saw the bathroom before the family moved in and it was so dreary! Now it's delightful! Great work. thanks ladies. The sink is actually an original sink ( 70 years old!) from a neighbors house. Wow it looks lovely and all for 200 bucks that's barely anything for a bathroom redecorate!